What if Tick isn't for you and you want to cancel? No worries, just follow these simple steps to cancel your account. Sometimes we will have customers email us asking to cancel their accounts, but we can't do this over email for security purposes; email is regularly compromised and once a Tick account has been canceled the account, and all its data, are gone forever. 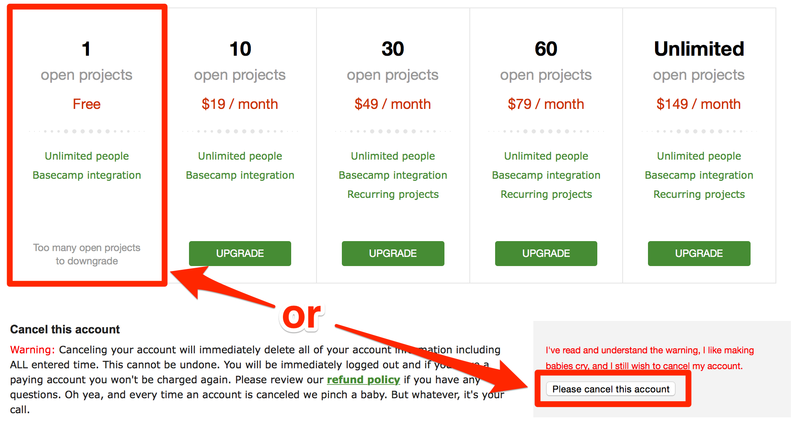 To Downgrade: If you want to downgrade to the Free plan then you'll need to first close all of your open projects. Then the option to downgrade your account will become available. The benefit to downgrading your account is that all of your data will be retained on our servers. This is useful in case you use Tick again, or if you want your time records for reporting purposes. To Cancel: If you want to fully cancel your account then you'll want to click Please Cancel This Account then confirm the warning message. If you do delete your time, all of your data will be permanently deleted from our servers.